As the long, hazy days of Summer give way to cool and crisp Fall mornings, you will begin to sense a change in more than just the temperatures. Within weeks, the leaves on the trees will begin their annual transformation from shades of green to a sea of brilliant reds, golds, ambers, and browns. This is the time of year when children go to bed dreaming of bags full of candy and what they will be for Halloween. Fall is when aspiring chefs begin planning for their Thanksgiving feast, and when avid College Football fans pray for an endless string of wins leading them to a glorious Bowl Game. It’s also a time when homeowners can take advantage of the “off-season” and begin remodeling their home at long last. While most remodeling jobs take place during the warm Spring and Summer months, many (if not all) builders and remodelers are willing to work year-round to get the job done. Just think, you could have your kitchen remodeled, basement finished, sunroom added, deck built and more in time for your guests to arrive for the holidays! A major advantage to electing to conduct your remodel now is that you may not have to get in line behind an endless string of other homeowners wishing to renovate their home at the same time. 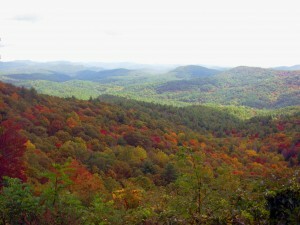 Take a cue from Mother Nature and begin a few changes of your own this Fall. The gifted craftsmen at Highlight Home Restoration can help you transform the look of your home – inside and out. We are highly skilled at Whole Home Renovations, Room Additions, Architectural and Design Services, Kitchen & Bath Remodeling, Landscaping & Ponds, Decks & Porches, Sunrooms, Basement Finishing….and Much, Much More! Getting started is easy! Simply call us to schedule a walk-through and consultation at 678-873-9234, e-mail us at info@highlighthomesga.com, or fill out our convenient online contact form. We look forward to the opportunity to help you “FALL” in love with your home again! 1) “Man-Made” Polymer Materials – Also known as solid surface countertops, the most popular manufacturer is perhaps DuPont for their Corian line. Corian offers a wide variety of colors, styles, and edges to choose from – anything from classic and understated, to quiet sophistication and beauty, to thoroughly modern and in your face bold. Their new Terra Collection offers the look of stone in an array of earthy neutrals. A word of caution, no matter which color you choose – always have trivets and cutting boards on hand, as Corian is not scratch-or-scorch resistant. 2) Silestone Quartz – Containing 100% natural quartz – Silestone provides that natural stone look you crave, but in a wide variety of daring colors so you can really find the look that will fit with your taste and decor. Best of all, Silestone is scratch-stain-and- scorch resistant AND it is considered earth-friendly (certified by the Greenguard Environmental Institute). Wait, it gets better… Silestone has developed a product that offers antimicrobial protection. Even DuPont has recently gotten in on the act with its Zodiaq line of quartz surfaces. Quartz is definitely the “one to watch” as its popularity grows. 3) Granite Tile – A far less expensive alternative to slab granite, homeowners may choose to use modular granite or granite tile to achieve a similar feel without killing their budget. The cost savings come from the relative ease of manufacturing and shipping tile as opposed to finding a piece of granite large enough and flawless enough to be custom cut and shipped to your home. While you may have to contend with the fact that you won’t have a smooth, seamless surface – you can still achieve a very beautiful and natural look to your new kitchen countertops. 4) Ceramic Tile – You can create a pretty, natural look in your kitchen and pay virtually pennies on the dollar to what you would pay for a granite slab with ceramic tile. Also offered in a wide variety of colors, sizes and styles – a touch of painted tiles in your backsplash can help incorporate a little bit of your own personality into the room. Just remember, ceramic can crack so be careful when putting dishes away in high cabinets. 5) Laminates – Perhaps the least expensive alternative in countertop materials, laminates made by manufacturers like Wilsonart and Formica have come a LOOOOOOOOONG way, baby. Constantly reinventing themselves, laminate manufacturers offer homeowners the LOOK of granite at a fraction of the cost. They also offer solid colors, patterns, even wood grains. Unfortunately, some laminates continue to be plagued by issues such as scratches, scorching, peeling/warping and fading over time. If you choose to go with a laminate, keep in mind that it may not last forever. 6) Polished Concrete – More of a hot new trend than a less expensive alternative, concrete that has been poured, tinted and polished to fit your kitchen is a really cool look in modern kitchens that bears mentioning. It is heat and scratch resistant, but will need to be sealed regularly in order to resist staining. 7) Marble – An oldie but goodie, marble has been used in kitchens practically since the dawn of man. Adding an air of traditional sophistication, there are a few drawbacks to keep in mind. While it is less expensive in comparison, marble is also less durable than granite. It is a softer, more porous stone – making it susceptible to stains, scratches and even cracks. The choices don’t end there! You also have stainless steel, wood and other natural stones such as limestone and slate to choose from. Do your homework to learn the benefits and drawbacks to each before deciding which route is best for your family. Once you do, contact the talented team of designers and builders at Highlight Home Restoration to help you install your new countertops. We can even help you redesign your entire kitchen to suit the needs of your growing family, if need be. 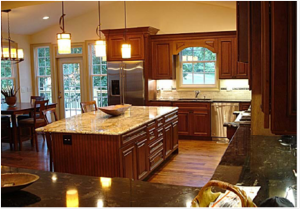 If you need help in deciding which countertops are best for you, Highlight Home Restoration can do that, too! We understand that this is no small decision – there’s a reason they call the kitchen the “heart of the home!” While we truly love working with granite and most other natural materials, our customers come first and we will do our level best to design a beautiful kitchen that meets both your needs and budget, while exceeding your expectations. Call Highlight Home Restoration TODAY at 678-873-9234, e-mail us at info@highlighthomesga.com, or fill out our helpful online contact form. We look forward to helping you make your kitchen one of the many “highlights” of your home! In light of a less-than-stellar economy and a roller coaster ride of a housing market during the past few years, treasure abounds throughout much of Atlanta in the form of bank-owned land and home sites many builders wish to have off their books. By going on a treasure hunt and purchasing a lot at bargain basement prices, you may find yourself with more to spend on the construction of a one-of-a-kind luxury custom home. By selecting a firm that offers both design and construction services – not only is the process far simpler than hiring a separate architect and builder, but you may find also yourself with more control over all of the elements that will make up your future dream home. Highlight Homes of Georgia is a premier design/build firm that understands how important a house can be to a family. Far more than just a shelter, a house is a place where memories are made and happiness grows. Each room is so much more than four walls and a door – a living room may represent the family game night battlefield, a window seat on the stairs could really be the storybook nook, a kitchen might be more of the burgeoning chef’s workspace, and a bathroom may serve as the future pop star’s practice chamber. Life happens in every room of the house, and – since every family is unique – we feel your home should be, too. Highlight Homes’ talented team of designers and builders will work closely with you throughout every step of your custom home project to make sure your visions are being met. We are extremely proud of our solid reputation for providing excellent customer service and exceeding expectations, while staying on target with regard to timing and budget. We pride ourselves in being a Green Builder, and have certifications from the National Association of Home Builders Green Building Program, Leadership in Environmental and Energy Design for Homes, Energy Star, Earth Craft Home, and the U.S. Green Building Council. Do Your Homework – In the event that you find an awesome bargain on a builder’s home site within a nice neighborhood, make sure that your concept of a custom home fits with the Home Owners Association’s Bylaws and Guidelines. Can You Dig It? – If you envision a home with a basement, make certain the lot is basement-friendly. Does it drain well, or will you have to contend with a flooded basement every time it rains? Is the building site sloped so you can have windows in your basement? Seem a bit daunting? Don’t worry! Highlight Homes can even help you find the ideal lot on which to begin building your home. We can meet with you to discuss your wants and needs, as well as budgetary restrictions. While we begin our quest for your new home site, you can begin putting together a special scrapbook of many of the elements you wish your dream home to contain. Pour through home décor magazines, search the internet, draw your own renderings, snap photos of other homes around town, etc… Once we’ve found the perfect lot, a Highlight Homes’ architect will sit down with you to look through your scrapbook , learn about your family, and develop a strong sense of what you are hoping for from your new home. 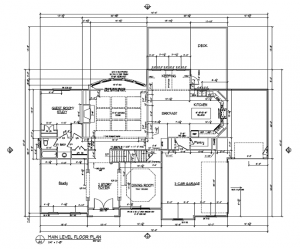 He will then take this knowledge back to his drafting table to develop truly distinctive house plans custom made to fit your family. When you approve of the plans, an estimate of construction costs will be developed and – once approved – construction can begin. Highlight Homes will take care of the acquisition of the necessary permits and the execution of inspections so that the construction phase goes smoothly from start to finish. Depending on the size and scope of your custom home, once the permits are obtained you could begin moving in within 6 to 12 months and start making memories right away. Highlight Homes welcomes the opportunity to become your family’s custom homebuilder. We invite you to learn more about us by visiting our website at www.highlighthomesga.com. When you’re ready to schedule a meeting, our team can be reached by calling 678-873-9234, by e-mailing info@highlighthomesga.com, or by filling out our convenient online contact form. We look forward to hearing from you soon!